Do your little dance with the other Lollipop Guild members when you go in this red Munchkin costume! This unique, plus size Wizard of Oz costume includes a shirt, shorts, and high socks. The shirt is made of polyester but features a plaid pattern. The wide white collar spills over the shoulders, and easily buttons down the chest with four white plastic buttons that actually clasp the shirt. The bottom of the shirt is in a jagged cut just like in the film. The red shorts also end in a jagged cut, and fit around the waist easily with a drawstring inside. The stockings are tall socks with white and red stripes and are capable of a lot of stretch. 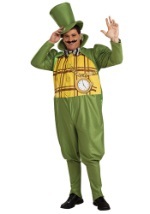 You'll be ready to become a fan favorite character from the Wizard of Oz when you go in this mens Munchkin costume!